Which is a worse sign: Playing poorly with your same team as last year or playing poorly with a similar team that is riddled with injuries? Welcome to Yankees-Red Sox 2019. After winning 108 games and the World Series a year ago, the Red Sox slump into Yankee Stadium with a 6-11 record. They have the worst run differential in the AL at -32 runs and have given up 6.24 runs per game. Their bullpen has actually been middle of the pack while their starting pitching has let them down with a 7.17 ERA, the worst in baseball. Only David Price (3.79) has an ERA under 7.98 within their regular rotation. Meanwhile, Boston’s lineup has been disappointing. J.D. Martinez is, more ore less, duplicating his results of a year ago while Xander Bogaerts and Mitch Moreland are both off to hot starts. However, Mookie Betts hasn’t been his All-Star/MVP self (more on that below) while Jackie Bradley Jr. hasn’t hit a lick. In total, the offense that set the world on fire in 2018 in 23rd in the league with an 83 wRC+. Through 17 games, Betts hasn’t quite hit like himself. For Boston, that’s OK; it’s only mid-April. The question, however, is whether Betts will return to his 2016/2018 MVP-esque level or will be the 2015/2017 All-Star deserving version of himself. The 26-year-old outfielder has six extra-base hits and has a .222 average a year after winning the batting title. Part of that is simply BABIP luck: He has a .229 BABIP after a .368 mark a year ago. Yet, there are some underlying questions. His walk rate is right in between his 2017 and ’18 marks, though it’s still impressive at 12.2 percent. His strikeouts, meanwhile, have continued to rise as a mildly alarming trend. His average exit velocity is down from 92.2 in 2018 to 90.0 mph this season. Perhaps Betts is just a hot week from re-establishing himself. With plenty of struggling players surrounding him, Boston could use the boost. Five of his eight hits have gone for extra bases in 36 ABs against Wednesday starter J.A. Happ. Andrew Benintendi (foot contusion) and Jackie Bradley Jr. (flu) were both held out of the Patriots’ Day game and are day-to-day. Brock Holt (scratched cornea) should begin a rehab assignment this week while reliever Brian Johnson is on the 10-day IL with elbow inflammation. Though the Yankees are starting two lefties, I doubt Pearce starts over Moreland (151 wRC+) in both games. Bradley’s illness could open the door for Pearce or Martinez to play the outfield and Moreland to man first. Sale’s dreadful beginning to 2019 has been one of the biggest stories not just for the Red Sox, but for baseball. 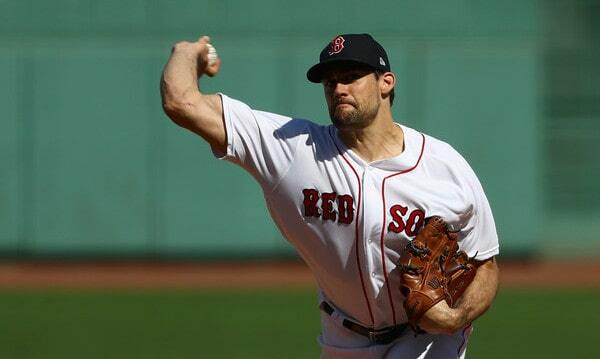 The lanky lefty received a $145 million extension this offseason and the Red Sox treated him carefully this spring, cutting down on his workload after he ended 2018 later than ever (the Fall Classic will do that) and with shoulder issues. Boston lined him up to start in this series. The Sox did the same thing a year ago and it was intimidating. Now, with Sale owning a 9.00 ERA, a 7.31 FIP and an alarming drop in swinging strikes, it could be an opportunity for the Bombers. His velocity on his four-seamer is down 3.4 mph from 2018 to just 91.3 mph in three starts. Now, his velo was down to start 2018, but not nearly this much and hitters have made him pay. He got his first swinging strike on a fastball in his third start and has a 6.5 percent K-BB rate after posting a 31.9 percent mark from 2017-18 to lead baseball by a healthy margin. It isn’t just the velocity; His command has also been suspect. Rachael McDaniel detailed it well for Fangraphs, but he hasn’t had good location on his slider, leaving it up in the zone. Can he regain his fastball, slider and his season? The Yankees, or what’s left of them, will be a tough test. Just like Sale, Eovaldi had the Yankees’ number a year ago and beat them in the postseason. I don’t need to remind you about ALDS Game 3, right? Good. Well, Eovaldi has arguably been worse than Sale this season. He’s allowed six home runs in 15 innings, going just five innings in each of his three starts. He has 10 strikeouts and 10 walks, an 8.40 ERA and a 9.22 FIP. The velocity on his four-seamer and cutter (high and low 90s, respectively) are about the same as last season with his splitter and slider down a couple of mph and curveball up half a mph. Still, batters have beat up on his signature cutter, owning a .941 slugging percentage against his second-most-used pitch. Again, he was especially good against the Yanks last season, so the matchup favors him, but Eovaldi has had a rough 2019 thus far. Medium to low leverage: Colten Brewer and Erasmo Ramirez. Velazquez started and went three innings in Patriots’ Day game Monday, so he’s likely unavailable for series. Brewer and Ramirez, the latter just called up, are newer names and have had mixed results for Boston thus far. (Ramirez has previously served as a starter and can provided length out of the bullpen.) Brasier and Barnes, meanwhile, have been strong, as has Brandon Workman who has yet to give up a run. Brewer, Workman, Hembree and Thornburg each threw one inning Monday and should be available to relieve Sale on Tuesday if the need arises. Watching on TV, Sale’s velocity will be a constant topic of conversation. I’d guess it’ll still be hovering in the low 90s. But the focus, at least to me, should be on his slider command. If he can get his back-foot slider going to righties, the left-hander can still be effective at lower velocity. If he can’t locate it, the Yankees should tee off. Can the Yankees get a quality start? They’ve gotten three this season and neither Happ nor Paxton have completed six innings. Quality starts as a stat are clunky, but the lack of QSs underline an issue for New York: They’re getting very little length out of their starters, 4.84 innings per start, to be exact. With Dellin Betances out and Chad Green struggling to perform, the team can’t afford to overload its bullpen, no matter its preseason hype. Six innings from either Paxton or Happ would be an upgrade. Another free agent starting pitching option has come off the board. According to multiple reports former Yankee Nathan Eovaldi has agreed to a new deal to return to the Red Sox. It’s said to be a four-year contract worth approximately $17M per season. We haven’t even reached the Winter Meetings yet and already Eovaldi and Patrick Corbin have signed. The Yankees were never seriously connected to Eovaldi this offseason. A few weeks ago it was reported they were not among his early suitors, then, earlier this week, the Yankees were said to have “engaged” Eovaldi, presumably after they learned they were out on Corbin. Eovaldi was linked to the Red Sox more than any other team this offseason. The Astros were also said to be in the mix. Personally, passing on Eovaldi was an easy decision for me. I like the guy and I’m glad he got paid after all he’s dealt with in his career. But a two-time Tommy John surgery guy who lives and dies with max effort velocity is risky as hell. More risk than I’m willing to assume at that price. Also, the “this enigmatic pitcher has figured it out!” profile is fool’s gold more often than not. With Corbin and Eovaldi off the board, the three best free agent starters still on the market are J.A. Happ, Dallas Keuchel, and Charlie Morton. The Yankees have been connected to Happ all offseason. Keuchel and Morton, not so much. The Yankees still have an open rotation spot even after re-signing CC Sabathia and trading for James Paxton. How they plan to fill it is anyone’s guess. For the fourth time in the last 15 years, the Boston Red Sox are World Series champions. They clinched the title with a Game Five win over the Dodgers earlier tonight. It’s the second straight year the team that knocked the Yankees out of the postseason went on to win the World Series. If you’re interested, here are the Game Five box score, video highlights, and WPA graph. Every single run in the ALCS, NLCS, and World Series clinchers came on a home run. They win championships, folks. The Red Sox won 108 games during the regular season and were never really challenged in October. They went 11-3 with a +35 run differential in the postseason while playing arguably the three best non-Red Sox teams in baseball in the Yankees, Astros, and Dodgers. One of the best teams ever, truly. I find it very fitting that, en route to a title, the big market team that maxed out its payroll beat the two big market teams that trimmed $50M off their payroll so they could get under the luxury tax threshold. Steve Pearce was named World Series MVP but it should’ve been David Price, who threw seven innings of one-run ball (on short rest!) in Game Five. 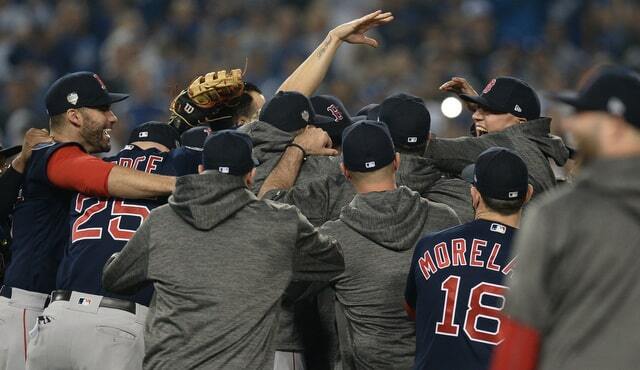 If Price going from capital-P Postseason Choker to should-be World Series MVP in the span of two weeks — two weeks! — doesn’t make people realize past postseason performance is descriptive rather than predictive, nothing will. Price allowed three runs in 19.2 innings in his final three postseason starts (and one relief appearance) this October.
? Because the Red Sox winning the World Series the year the Yankees were expected to emerge as MLB’s dominant team isn’t bad enough, Boston did it with a bunch of ex-Yankees. Eduardo Nunez and Pearce had big hits and Nathan Eovaldi was unbelievable in October. The only other 2018 Red Sox with ties to the Yankees is non-postseason roster infielder Tony Renda. The Yankees got him in a minor trade with the Nationals, then flipped him to the Reds in the Aroldis Chapman deal. Now that the World Series is over, the offseason can begin. The Yankees have more heavy lifting to do this winter than they’d probably like, especially on the pitching side. We’ll see what happens. 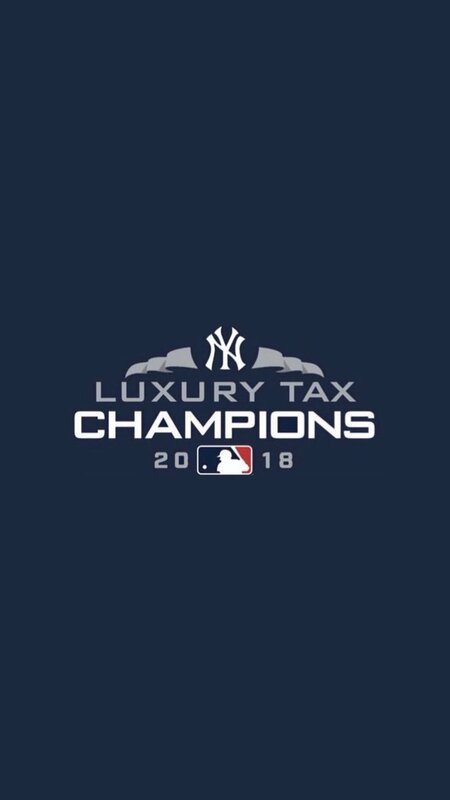 All I know is I’m tired of seeing the Yankees settle for the Wild Card Game and I’m completely sick of hearing about the luxury tax. Hopefully the Yankees go back to being the Yankees this winter.